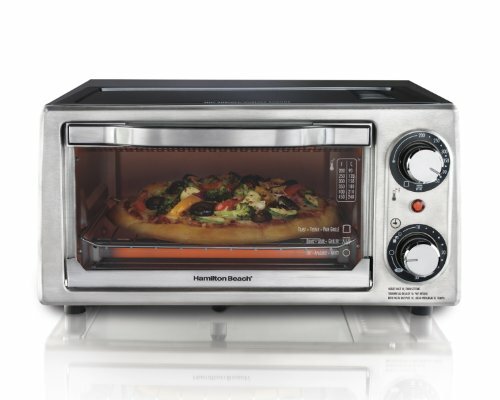 In my research, I found that Hamilton Beach 31137 4-Slice Toaster Oven is only for those who has limited budget and are looking for an affordable product. To be honest, it is quite mediocre in numerous toaster ovens. The advantage of this oven is fast and energy-saving. It has basic functions like adjustable temperature scale (250 to 450 degrees Fahrenheit), automatic 30 minutes timer and 3 cook settings (bake, broil and toast). This oven includes a bake pan, which can be used to bake a nine inch pizza. Rubber Feet – The oven rests on rubber feet on the bottom edges, to avoid slippage on low friction surfaces such as kitchen counters. Energy Efficient – 28% faster and uses up to 80% less energy than other ovens. What Do Buyers Say About The Hamilton Beach 31137? For light cooking and daily use, this oven is fast and energy efficient. Products like chicken nuggets and medium slices of toast can be handled. Also, it creates less indoor heat as compared to a regular oven. It does not take a lot of space, and due to its small size and efficiency, it is just for small families or people living alone. The labeling font is a bit small to read comfortably, and the temperature scale is not completely accurate, meaning that you have to take some care to avoid burning the food. Some buyers complained that it can’t toast 4 slices but maybe only two slices of bread at one time. I think this might be overstated but we could conclude that its capacity is smaller than other 4-slices models. If your family have over 2 persons, you’d better choose other models. Like other ovens, it also makes a very loud clicking sound and an equally loud “ding”. The rack and oven tray can’t fit at the same time, which means that you have to remove one for the other to slide in. Small, lightweight and with a modest price tag and basic functions, this Hamilton oven is designed for those single persons. It cannot, however, replace a regular oven due to its limited capacity, but is a handy appliance for lighter cooking needs.